The first and foremost attention grabbing element on anyone's social media page or handle is its cover image. And most often it is also the most ignored as well. Having an attractive cover image generates interest with the viewers. With so much competition in the market, you don't want to miss a single opportunity to attract more audience. 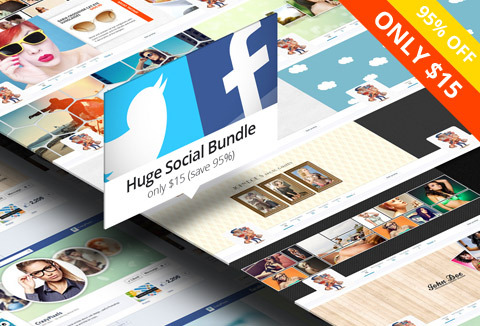 With today's deal you get loads of Facebook & Twitter covers to create that first impression with your viewers. Preview of Facebook & Twitter covers by CrazyFuse. Twitter which has over half a billion users is one of those platform that communicates with short-lived messages known as tweets. With the way Twitter works, you only get a few seconds to create an impression on your audience. Having a cover image that is informative as well as interesting can convert those few seconds into minutes and ultimately impact your business positively. Following are 27 unique and high quality templates that are surely going to help you improve your or your client's twitter page a lot. Facebook is the only social media platform with over 1 billion users. It is one of those platforms that has kept on upgrading and refreshing its looks and functionalities at a timely pace. The Facebook Timeline feature was introduced back in 2011 but most people are not using this awesome feature to its full potential. With the Timeline feature, anybody can customize their cover image and give the profile a slick and attractive look. Having an enticing cover image helps you a lot in many ways other than just attracting audience. Following are 29 different Facebook cover designs to put together some stylish pages for yourself or any of your clients. Nancy Young: "I have bought your design pack and I’m more than happy with it! All products are perfect, quality, and creative!" Tim Soulo: "Thank you a bunch for this awesome opportunity. Can’t wait to see your new designs. I wish you a lot of inspiration for your future projects!" All files will be delivered as an instant download after your payment. You will need Adobe Photoshop or a similar application which can edit PSD files in order to use these templates. The pictures are not included in the pack. Ready to grab these Facebook & Twitter covers at 95% off?